Okay, I just went to New York for the first time and I had a great time. Part of it was the company, part of it was the city, and a big part was the food. I love to eat when I go on trips. And it was no different when we were in Hawaii. Some places we eat at because it’s what that place is known for, some we go based on recommendations, and some we go to because location, location, location. A good chunk of eating we did at the Hilton resort. Like the coffee shop/ice cream place in the picture above. 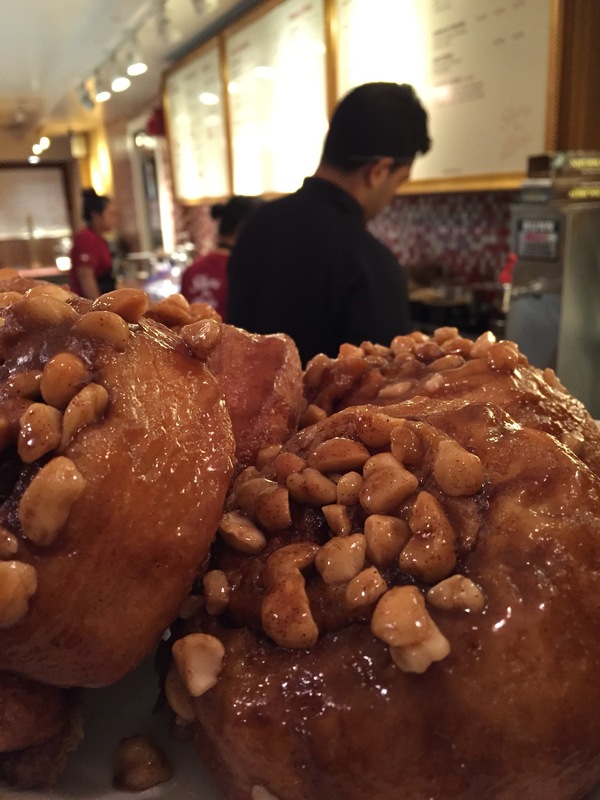 Those sticky buns? I didn’t end up eating them. I ended up with ice cream and it was good. So where did we go to eat outside of the resort in Hawaii? We went for the traditional plate lunch with macaroni salad. Here I ate the fish and Will got the Mix plate. We went after we hiked Diamond Head, figuring that would be a good time to eat a ton of food. I don’t know why, but I love how Hawaiian plate lunches come with macaroni salad. Its really the only time I eat macaroni salad. What was good: the portion sizes were big, the price is cheap, and the macaroni salad was yummy. I liked my mahi mahi, which was breaded and cooked. I got so stuffed. And it was an bus stop between Diamond Head and our hotel. What wasn’t: they mixed up that I wanted fries and gave me rice, but it wasn’t that big of a deal. I just ate my husband’s fries. As good as they say? I liked the decor and had read that it was a great place for coffee. So of course I had to check it out. 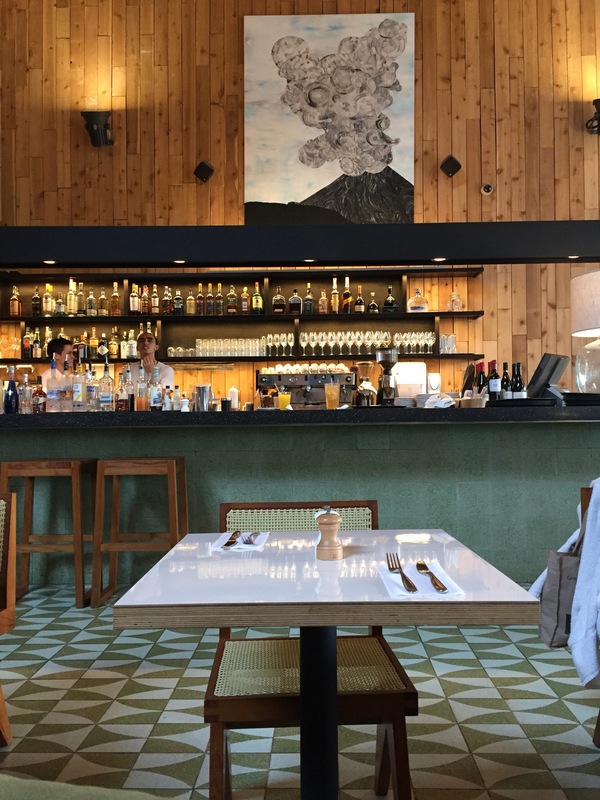 Bills is a Sydney based restaurant that has a location on Oahu and in London, Tokyo, and Seoul. 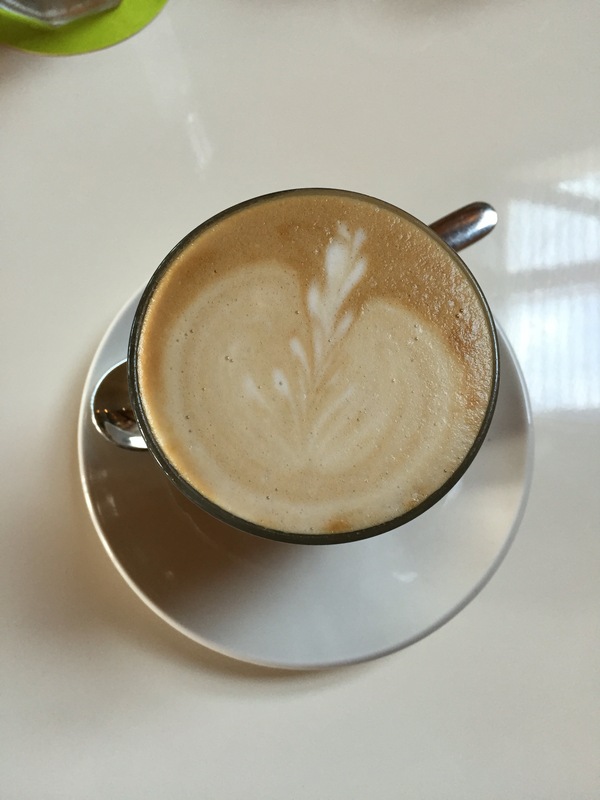 What was good: the coffee and food. I liked my avocado toast and latte. They have a lot of options for the veggie inclined and some for gluten free people too. What wasn’t: the service. It was impersonal and not too friendly. Maybe they were just busy and it was a bit of a wait, but the hostess did not have the mostess. Maybe this seems cheesy and some people would say it’s not worth they hype, but my husband and I did enjoy our date night at the Top of Waikiki. 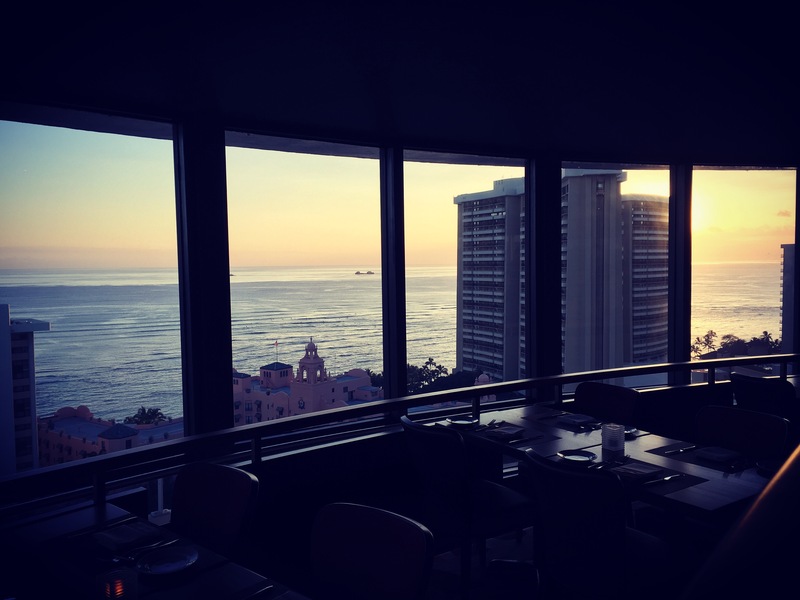 The restaurant rotates 360 degrees, although if construction on Waikiki continues, the view may not be worth it much longer. We went right at sunset. What was good: The view. The service. Our waiter was friendly and even talked to us about where to eat like a local. He was the one who recommended the plate lunch place. What wasn’t: Nothing was bad. The food was good. We ordered several things from the Sunset appetizers and salad, but still got pretty stuffed. It wasn’t the best we’d ever had, but we really came for the view. They even have a bar that does not rotate, if you just want to relax and look out over Waikiki. 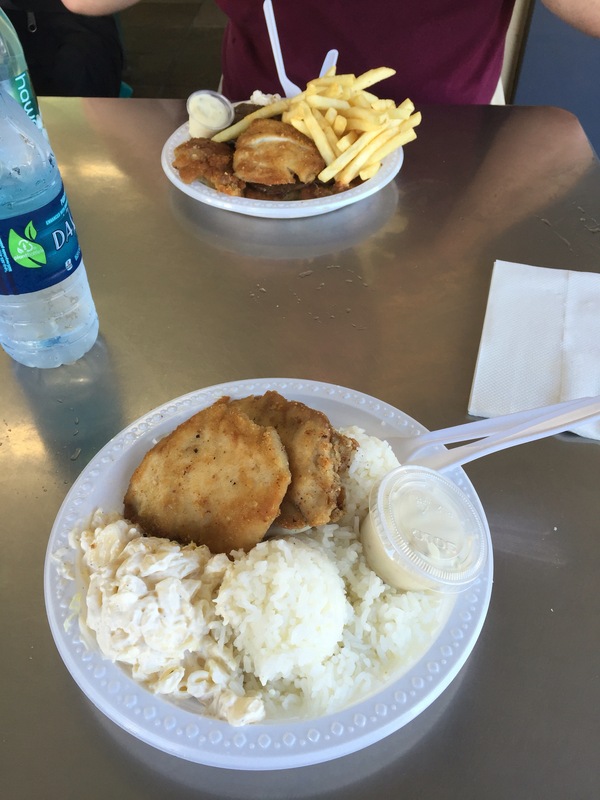 Any favorite food spots in Hawaii?